Pinterest group boards are a great way to expose your blog or business to a larger audience and drive traffic to your website. All the Pinterest experts talk about the benefits of group boards, but the conversation stops there. When you’re just starting out, you don’t even know what a group board is, let alone how to find them or what to do once you’ve joined one! In this post, I’m going to outline everything you need to know to get started with Pinterest Group Boards. You’ll learn how to find and join high-quality group boards, how to pin and what to pin to your group boards, and how to analyze poor performing boards. Pinterest group boards are also known as shared boards, contributor boards, collaborative boards, and community boards. If you’ve ever heard someone say one of those terms they’re referring to group boards. Group boards are just like regular boards, but instead of one person adding Pins, group boards have multiple people adding – hence the name group boards! Group boards were originally created as a way for people to share ideas with one another. For example, if you’re planning a trip with a group of friends, you can create a group board and share ideas for your trip with one another. Or, if you and your girlfriends decide to lose weight together, you can create a group board to share recipes and workout ideas. You know a board is a group board by the little circle in the left bottom corner of the board. The top left and bottom right boards are personal boards. The bottom left and top right boards are group boards. Now that you know what group boards are and how to identify them, why should you join group boards? Why Should You Join Pinterest Group Boards? Like every good thing on the internet, marketers have found a way to turn group boards into powerful traffic machines. 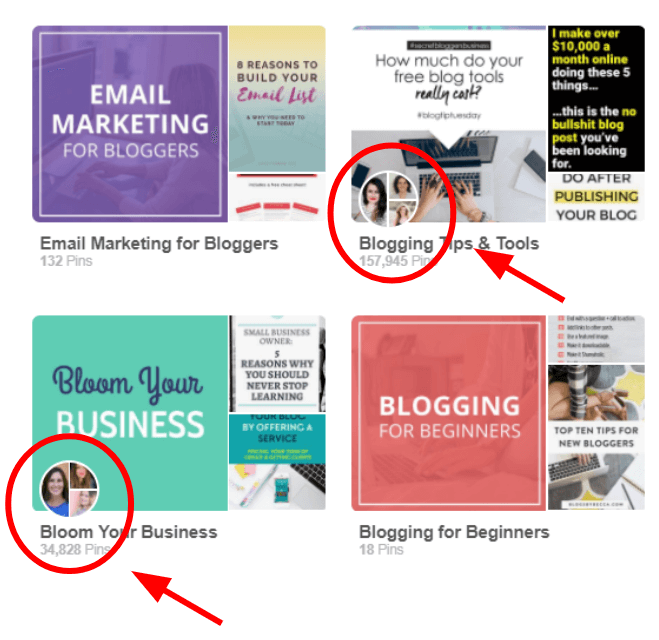 Group boards are an outstanding way for bloggers to get more eyeballs on their content. In my first month as a blogger, Pinterest Group boards were the largest source of my traffic and helped drive over 3,000 people to my website. It’s true. You can read all about it in my January Blog Traffic Report and learn how I generated 5,433 pageviews my first-month blogging. The reason group boards work so well is that they allow you to get in front of other people’s audiences as well as influential Pinners. This type of exposure instantly amplifies your reach! Take a look at the screenshot of one of the group boards I’m a part of. This group board has over 20,000 followers and over 2,000 contributors. When I pin content to this board, it’s not only seen and shared by those 2,000 contributors, but it also has the potential to get in front of the 20,000 people following the board! This is extremely powerful. Particularly for brand new bloggers with zero audience. As I’m sure you can guess, there’s a little strategy involved to getting your Pins reshared by the contributors and seen by the board followers. To learn these more advanced strategies, sign up for my free Master Class: How to Grow Your Traffic in 30 Days or Less. Now that you know why you should join group boards, how do you even find group boards to join? There’s a handful of ways to find group boards to join on Pinterest. Unfortunately, many of the methods require a lot of research and digging around and often leave you joining a bunch of low-quality, crap boards. Luckily, there are two methods that work well. The first is Facebook Groups! There are hundreds of Facebook Groups dedicated to bloggers. In fact, you’re welcome to join my Facebook Group: Team of One Biz Owners. If you haven’t jumped on the Facebook Group bandwagon yet, you need to read: 9 Facebook Groups You Need to Join Now to Grow Your Blog. These groups make outstanding communities to learn from your peers, collaborate with one another, and promote your blog posts. Once you’ve joined a Facebook group, you can make a post asking if anyone has a Pinterest Group Board open to contributors. Some Facebook Groups even have dedicated threads to share open group boards! The second method to find Pinterest Group Boards is my secret method to find high-quality boards that are actually worth joining! All you do is research your top competitors and peers in your niche. Who in your niche appears to be killing it on Pinterest? When you search keywords you want your content to rank for, who pulls up in the search? Find your peers and competitors and then see what group boards they have on their profile. You’ll need to click on each group board to see if it fits what you’re looking for and if they’re accepting new contributors. To see the method in action, watch the short tutorial video below. I need to warn you, this method requires a fair amount of research and digging around. It’s highly unlikely you’re going to find 10 killer boards from looking at your top three competitors. Most of the boards they’re a part of will be closed to new contributors. 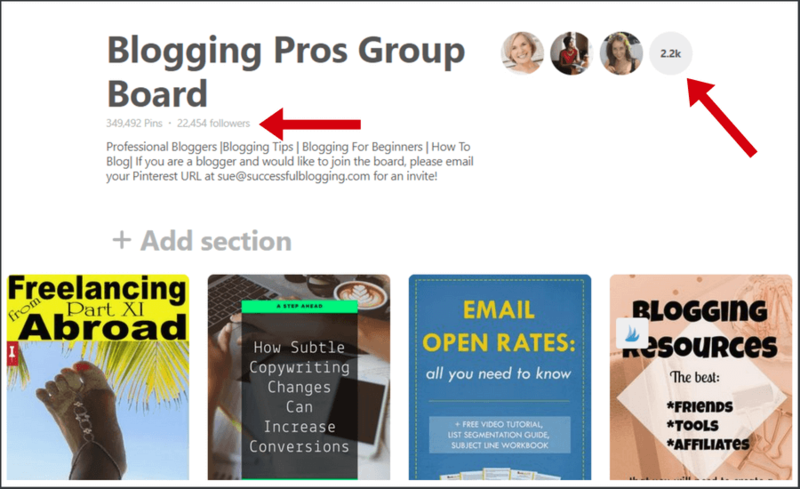 …the boards you find will be much higher quality boards then if you used an outdated tool like Pin Groupie or found an outdated blog post with a massive list of group boards to join. You simply read the board description to find out if it’s open to new contributors. Below is an example of a board that is CLOSED to new contributors. Below is an example of a board that is OPEN to new contributors. As you can see, the OPEN board provides detailed instructions on how to join the board. Your next step is to follow the instructions and submit your request to join the board. Each group board owner has different rules for how to join as a contributor to the board. First, you need to read the instructions on the board description and follow them EXACTLY! If a board owner says you need to follow them on Pinterest, you need to follow them on Pinterest. If a board owner says you need to email them at a specific address, email them at that address. Don’t send them a message through Pinterest or the contact form on their website! Most board owners ask you to send an email requesting to join the board. It’s important to include some specific information in your email request. First, include the name of the board you want to join. Many group board owners manage multiple boards and it’s really helpful to let them know which board you want to join. Next, you need to include a link to your Pinterest profile as well as the email address associated with your Pinterest account. These two pieces of information are CRUCIAL. Without them, the board owner cannot add you to the group. It’s also nice to include some details about the type of content you Pin and why you want to join the board. Including a promise to abide by the rules is a nice touch as well. And finally, keep your email short! Personally, I don’t read long requests to join my group boards. I skim the email, check out their Pinterest profile, and then add them to the board if they seem to be a good fit. 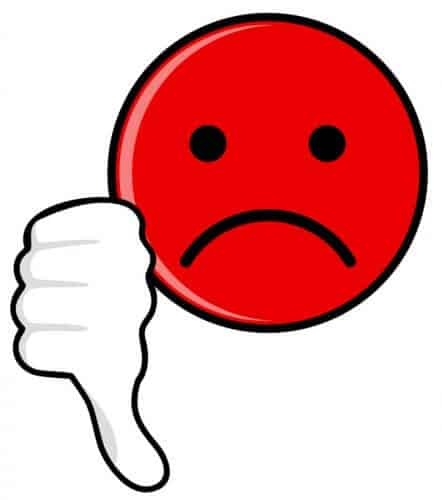 Keep in mind, not all of your requests to join group boards will be accepted. My experience has shown that 50 – 60% of my requests are accepted. If you want to join 10 group boards, expect to request to join about 20 boards. To give you some practice, I’d love to have you join my group board, Blogger Traffic Paradise. Follow the instructions I’ve provided in the board description on how to join. Once you’ve been accepted to join your first group board, what should you pin to the board and how often should pin content? I’ve witnessed a LOT of confusion around pinning to group boards. Many bloggers seem unsure of what content to add to boards and how often they should add content. You absolutely want to add pins leading to your own content, but it’s also okay to add pins leading to other people’s content. … as long as it complies with the group board rules. Isn’t that liberating? Are you doing a happy dance at your computer right now? Or, maybe you’re not doing a happy dance. I realize that my statement above could actually overwhelm you even more. Many people want a simple prescription or formula to follow. But, here’s the deal. There is no magic formula when it comes to the number of pins you pin each day or what time of day you pin. In reality, you need to run a lot of tests to find what works best for your business and your audience. If you’re using a tool like Tailwind to schedule your pins, and you’re utilizing the Smart Schedule, Board Lists, and Shuffle Queue features, then you can schedule your pins to relevant board lists and be done with it. You can change up your strategy every couple weeks, use the analytics to figure out what’s working and what’s not, and let Tailwind do the rest. With Tailwind, there is no need to overthink your Pinterest strategy. If you want to learn step-by-step how to schedule content to your group boards with a stress-free, automated process, make sure you register for my free Pinterest Master Class. In addition to complying with the board rules, you want to make sure you’re being a good board contributor and sharing pins from the board. Many Pinterest marketing experts talk a lot about the 80/20 rule, which means 80% of the pins you share should be OTHER people’s content and only 20% should be your own. I disagree with the 80/20 rule. The entire point of being on Pinterest is to get your own content seen. It can’t be seen if you’re burying it under other people’s content! However, to be a good group board member, you need to share content from that group board. Group boards are meant to be reciprocal, which means for each pin you add to the board, you share someone else’s pin from the board. This is why I subscribe to a 50/50 rule for pinning – I pin 50% my content, 50% other people’s content. Now you know how to find, join, and pin to group boards on Pinterest. Once you’ve joined a few group boards and you’ve been pinning to them for a while, you’ll need a method to analyze the boards. Once you’ve joined a few group boards, you’ll want to keep track of their performance. It’s important to track your boards and drop the poor performers. If you’re pinning 30 pins per day, you want to be sure those pins are being seen and getting traction. To avoid completely wasting your time, or your precious pins, you can use the Board Insights tool from Tailwind. You can try Tailwind for free. Just click here and sign up using my referral link. Once you’ve created your account (and allowed Tailwind time to gather data from your boards) you’ll want to select “Board Insights” on the left column. Board Insights allows you to sort your boards by group boards, secret boards, or regular boards. To analyze your group boards, just click the box next to “group boards” along the top bar. Then, you can click on each individual board to see how the pins you’ve added to the board have performed. I recommend going through this process once a month in the beginning and then quarterly once your group board strategy is more established. I have a handy spreadsheet I use to help me keep track the data so I can make strategic decisions on which boards to drop. I provide a copy of this spreadsheet, along with step-by-step instructions on how to analyze your boards and when to drop poor performing boards, in my Pinterest Traffic Trifecta course. To learn more about the course and the three surefire strategies that make up the Traffic Trifecta, be sure to register for my free Master Class: How to Explode Your Traffic with Pinterest. Whew, you made it to the end! You are now ready to go find group boards in your niche, request to join group boards, pin content to group boards, and analyze group boards to determine poor performers!